Our product has gone through strict quality inspections in various conditions. For example, SWING DOORS are tested over 500,000 times. These are 5 times more than JIS industry standards. Our doors are built to meet the needs of every specific customer. We ensure that we fully understand customer’s needs and expectations. Our products help to save energy and hence cost. For example, using our HIGH SPEED DOOR reduces heat loss at openings by approximately 80%. Our products are made by our well-trained and skilled manufacturing staff in our own factory, in Saitama since 1984. Core components, such as motors are also made by reliable Japanese manufacturers. UNIFLOW has obtained ISO 9001: 2000 certification on quality management, defined by the International Standards Organization (ISO). We are continuously improving customer satisfaction by improving our quality management. and our HIGH SPEED DOORS is reputated for its originality. We are proud of our long-term relationships with many of the most successful shops and factories. We have been the dominant leader in SWING DOOR industry in Japan since we introduced SWING DOORS to Japanese market in the late 1970s. ※ Figure in 2013 based on the production volume In 2014, we have manufactured and sold approximately 30,000 SWING DOORS out of the estimated 35,000 doors produced and sold in the entire market, making the share of UNIFLOW to be 85%. With 25 years of experience in manufacturing and selling HIGH SPEED DOORS in Japan. The strength of UNIFLOW lies on the fact that we carry out all operations in our own premises. We serve our customers in close liaison across all departments which are composed of Sales, Research and Development, Engineering and the Factory. Understands customer’s needs and provide the best solution. Provides technical information and solution for every needs. Ensure that each product meet our high quality standards. Responsible for installation and maintenance. Please be informed that Uniflow International will be closed from February 2nd to February 6th, 2019 for the Chinese New Year Holiday. The office will resume opening on February 7th. 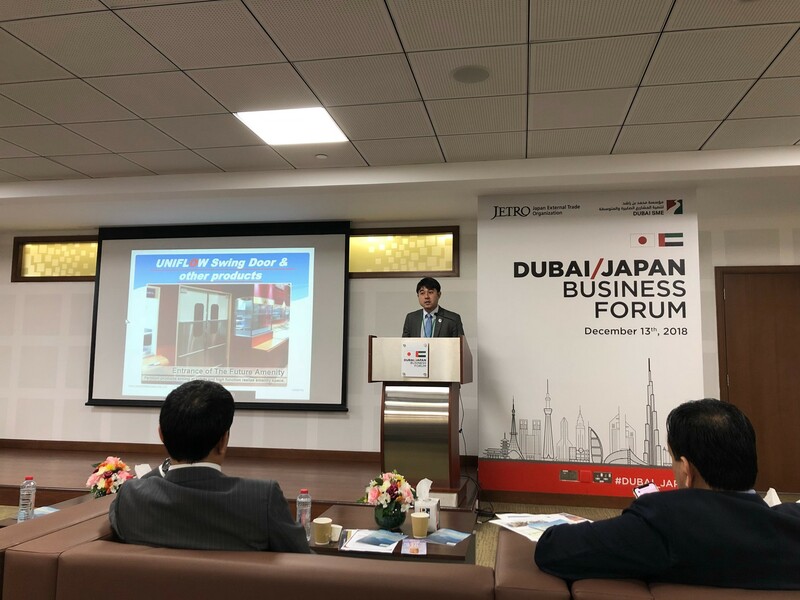 The representative of UNIFLOW INTERNATIONAL participated in Japan UAE-Business Caravan 2018 organized by JETRO held on 09-12/Dec.